There are no harsh additives, it's gentle but effective. As you would expect, it contains NO animal products, wheat, yeast, gluten, soy, milk, salt, artiﬁcial ﬂavors, colorings or preservatives. 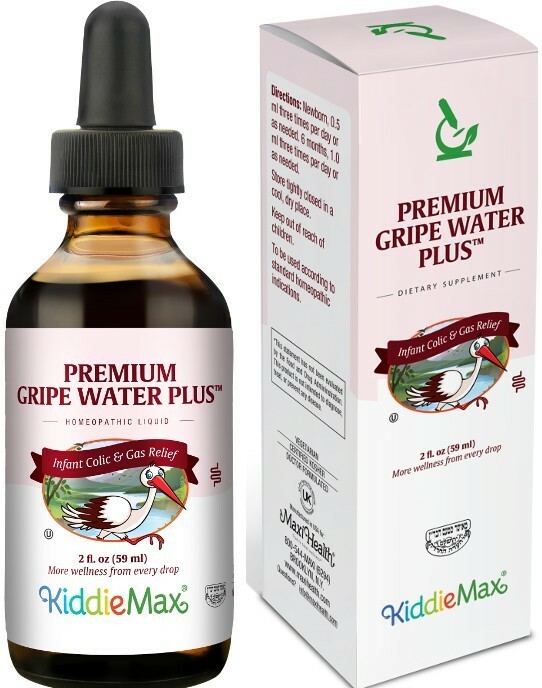 Get Premium Gripe Water Plus from Maxi Health. Your infant baby and you both deserve it. Newborn, 0.5 ml three, times per day or as needed. 6 months. 1.0 ml three times per day or as, needed. To be used according to standard, homeopathic indications. (In equal parts) Chamomilla 3X (Chamomile) HPUS, Mentha Piperita 3X (Peppermint) HPUS, Zingiber Ofﬁcinale 3X (Ginger) HPUS and Foeniculum Vulgare 3X (Fennel) HPUS. Other Ingredients: USP Puriﬁed Water, Vegetable Glycerin. This product contains NO animal products, wheat, yeast, gluten, soy, milk, salt, artiﬁcial ﬂavors, colorings or preservatives. For infant relief of irritability, hiccups, gas relief, digestive aid, bloating and colic.